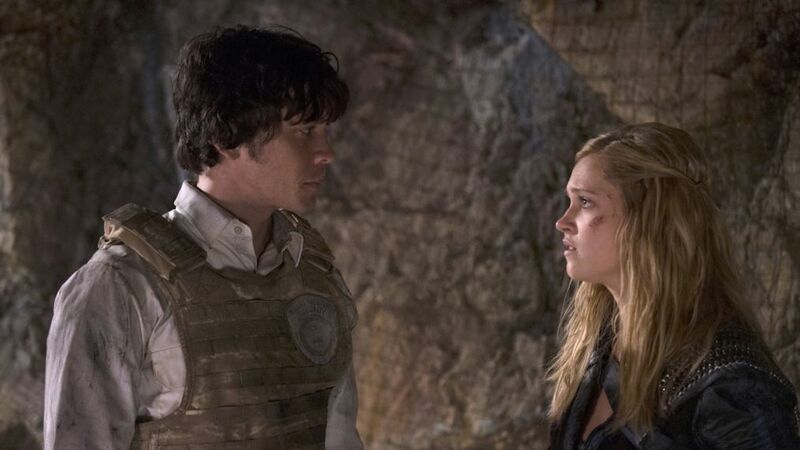 While the show is only loosely based on the books and has now far surpassed any territory explored in the source material, it bears mentioning that Bellamy and Clarke do have a romantic relationship in the books on which the show is based. They eventually get engaged, and it's implied they build a home in the woods. It would be pretty sweet if the show went that route with the characters, but there’s something saccharine about it that doesn’t quite jive with the gritty, dark world portrayed in Rothenberg’s vision. That said, when it’s all over, maybe Bellarke will take their relationship to the next level. They both definitely deserve a happy ending! “Platonic” isn’t the word most shippers would want to describe Bellamy and Clarke, but right now, their non-romantic bond is pretty unique. Most genre shows tend to put their male and female leads together (Richonne on The Walking Dead, Varchie and Bughead on Riverdale, Mileven on Stranger Things, etc. ), which sets Bellamy and Clarke’s special, deep bond apart from the rest. As friends who care for each other deeply but don’t pursue a romantic relationship, Bellamy and Clarke challenge the stereotype that male and female leads have to end up together. There’s something to be said for friendship, too, and being platonic pals provides a kind of representation that television is sorely lacking. There is perhaps no other pairing on the show that has endured as much as a cohesive unit as Bellamy and Clarke have. They came down from space together, fought the grounders together, irradiated Mount Weather together, and have saved each other’s lives several times every season. There’s a reason they’re so close — they’ve been through many of the same terrifying, life-threatening experiences together, and they share an understanding that no one else has. To use Stranger Things’ “Murray Bauman scale” of what makes a good relationship, a couple needs chemistry, history, and shared trauma. Bellarke definitely have all of that and more, and at times, they each seem to know the other person better than they know themselves. There’s currently a pretty huge (and badass) roadblock on the highway to Bellarke: Echo. During that six-year time jump, Bellamy found it in his heart to forgive the former Azgeda devotee and fell in love with her. Season 5 started with them as an established and happy couple, although there wasn’t much in the way of background or buildup explaining how they went from barely being able to stand each other to an established relationship. Echo’s awesome. She’s incredibly loyal to her found family from space, she’s an excellent tactician, and her instruction in fighting clearly helped Bellamy stay alive when he was forced into the arena. But many fans would rather see Clarke by Bellamy’s side, which would mean “Becho” would either have to break up or Echo would have to die… and it’s been established that Bellamy doesn’t handle his girlfriends’ deaths well. Whether or not romantic “Bellarke” is the endgame for their characters, there have definitely been a few moments that seem to have more than just a friendly vibe. Since the show’s first season, there’s been at least one scene every 13 episodes that hints there’s more in store for “the head and the heart” — even if they’re with other people, or angry at each other, or separated. Notable moments include: Bellamy and Clarke’s final goodbye in Season 2, their use of repeated phrases (“if you need forgiveness, I’ll give that to you,” “together,” etc. ), their insistence that the other person be on Clarke’s survival list in Season 4, their final goodbye in Season 4, and Bellamy’s heartbroken realization that he left her behind. One of the biggest shockers of Season 5 came when Bellamy betrayed Clarke and gave Madi the Flame. A course of action Clarke was strongly against, it earned him a pretty brutal slap and abandonment to fight to the death in the arena — and a new level of Clarke’s hatred, considering the danger becoming Commander places her “daughter” in. All things considered, this isn’t the first time Bellamy and Clarke have crossed each other for what they believe is the greater good. Clarke enraged Bellamy by staying in Polis instead of returning home to Arkadia in Season 3, and then Bellamy helped massacre an entire grounder army and betrayed Clarke. And then, in Season 4, Clarke locked his sister out of the bunker with the intent to let her die in Praimfaya. For two characters who are usually considered a united front, there have been plenty of times where they’re not united, or actively working against each other. Whether platonic or romantic, it can hardly be denied that Bellamy and Clarke love each other. Octavia said as much to Bellamy when he came to talk her out of killing Clarke, saying he was “pleading for the life of a traitor who [he] love[s].” He didn’t deny it. Why would he? Throughout the series, Bellamy and Clarke are at their most emotional — and often make the most illogical decisions — when the other person is involved, and that’s because of the undefined but mutual love between them. They’re usually the only people who can get through to each other and make the other see sense, and the way they look at each other is evidence enough of their connection. CON: Where would they go from there? If Bellarke were to happen, it almost begs the question: What next? Obviously, fans would want a clear-cut, happy ending like the one featured in the books, but that’s not likely to happen. And if that didn’t happen, the show would risk enraging a pretty large portion of its fanbase. Sometimes the anticipation of having something is better than having the thing itself, and it would be a bummer to find out the anticipation of Bellarke canon was better than an actual relationship between the two. Platonically, Bellamy and Clarke are the core of the show. Romantically, would the same be true? Would fans enjoy seeing “relationship drama” between them or be satisfied with the way the two came together? There’s a risk inherent with making such a large ship canon, and the writers may not want to approach that iceberg for fear of sinking a ship that’s already fully sailing. Over five long seasons, a number of fans of The 100 have weathered multiple separations and betrayals, hookups with other characters, and a six-year time jump, all while still holding out hope for a romance between the show's two protagonists: Bellamy Blake and Clarke Griffin. Some fans adore the ambiguous bond between Bellamy and Clarke, and want #Bellarke to end up together when all is said and done. Though the pair haven't so much as shared a kiss (except for the peck on the cheek Clarke gave her friend at the end of Season 2), they've managed to win numerous online polls and contests, including "Best Kiss/Sexiest Moment" in E! Online's TV Scoop Awards. But while supporters of the pairing are many and lively, there are also some who would rather see the two leaders stay best buddies. Click through the gallery above for some reasons why 'Bellarke' should — or shouldn't — take their relationship to the next level. Then, let us know what you think in the comments below!